“I estimate that 10,000 stremmata has been burned down in the last three days,” mayor of Zakynthos Pavlos Kolokotsas told media on Monday, as the wildfires on the island continue to rage for third consecutive day. 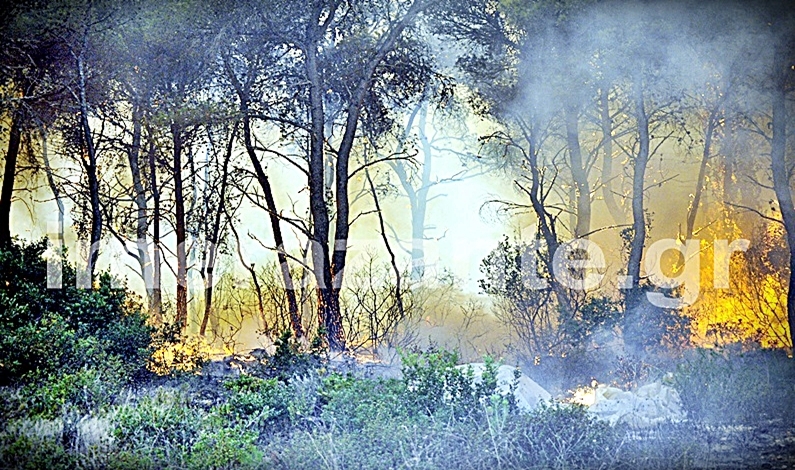 “It is a major ecological disaster, a perennial pine forest is on fire right now. 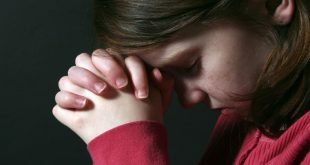 Whoever will be proven to have set the fire should receive an exemplary punishment,” Kolotsas said. Pine and olive trees, barns with animals. All turned into ashes. Forest land in the North-West of Zakynthos, around the villages Anofonitria, Volimes, Maries, Orthonoi has been burned down. In the last 24 hours wildfires burned in addition in Kampi, Pelilompi, Skouta, Kapeleti-Ano Volimes, Argasi and Agalas in the South-West and -East of the island. Last night in Maries was the sheer nightmare: the blaze surrounded houses, shops, barns and storehouses. A municipality bus had to trasnfer some 20 elderly to a safe area. The other residents remained in the village to assist firefighters however they could. As the first fires started to reach the village houses firefighters, volunteers and locals built a wall against the blaze. With water hoses they kept yards and walls wet to prohibit the flames from destroying their properties. Three firefighters have been taken to hospital due to respiratory problems. One of them has in addition a burn injury on the neck. One house outside Maries, several store- and farmhouses were burned down. 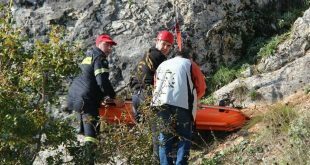 Two elderly and their child with special needs were rescued at the last minute. More than 150 firefighters and aerial means are operating in the area, they extinguish a fire here but another revives there. State ERT TV reported at 6:00 p.m. on Monday that the situation was just a little bit better. Fire extinguishing operations are continuing without a break in order to avoid another hell of a night. 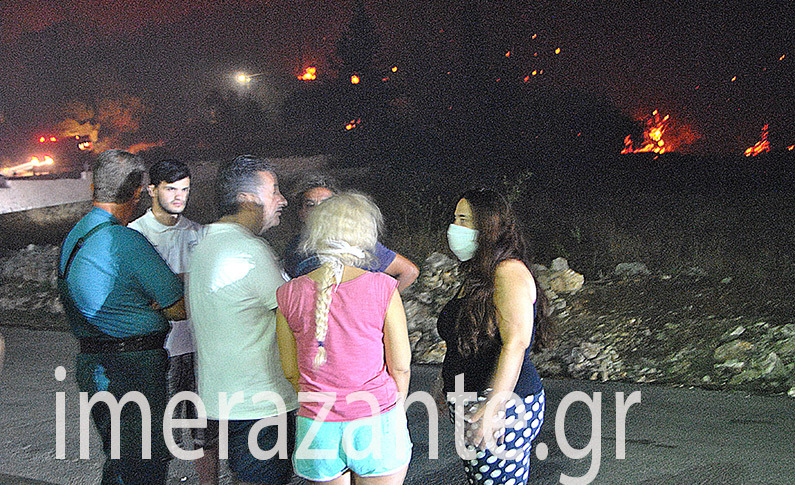 Local media imerazante.gr, reports at 7:00 p.m. that the fire front in Maries in in decline, however, fire brigades are on alert due to the frequent revivals of the blaze. The fire extinguishing operation will continue at night and tomorrow, Tuesday. Water dropping aircraft and helicopters fly only before dusk..
At the same time, authorities are in intense alert to identify alleged arsonists as also the Greek Civil Protection suggest that the cause of the fires was arson. The local Fire Service reported on Sunday evening that three new fires broke out at 23:45 before midnight within a distance of just 1 km. On Sunday, a water dropping helicopter located two suspects on a motorbike in an forest area. A manhunt brought no result. According to media information, a young man has been detained and is interrogated by police. He was driving a motorbike near the area where a new fire had started. He refused to stop to a police signal, he tried to flee but was apprehended. Authorities reportedly are seeking two more people who were with the young man. ΑΝΤ1 TV reported later that police found no evidence of his involvement in the fires. “This is unprecedented,” Kapakis underlined. 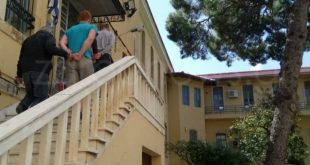 Special units for arson crimes from the Fire Service and Police units have come to Zakynthos in order to conduct investigation. Locals speak of the “arsonists’ mafia“, writes Kefaloniapress.gr, form the neigboring island of Kefalonia. Galiatsatos revealed that the area currently on fire includes also the 15,000 stremmata with a controversial ownership and the dispute between the new owners and local bodies to carry out the the legal dispute in Greece’s courts. “He implied that there is a possibility that certain interests are behind the claim,” RealNews comments. The land sale of 15,000 stremmata to a foreign fund a couple of years ago, triggered an outrage among the local population, authorities, the local Metropolis and other bodies who claimed the sale was illegal as the “land plot” as it was forest land, municipality land, byzantine monasteries belonging to the Church but also houses and businesses and infrastructure. The Metropolis of Zakynthos had filed a lawsuit. On Tuesday, deputy Minister for Citizen Protection, Nikos Toskas, also expressed suspicion that the fires on Zakynthos were caused by arsonists. “It is a common perception that most of the fires are related to arson. 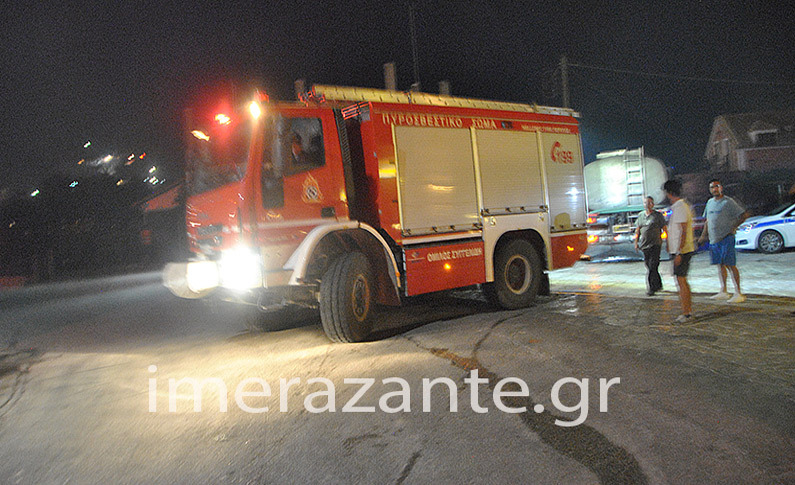 I have no doubt that arsonists hit on Zakynthos, there are reports form police investigating in the region. 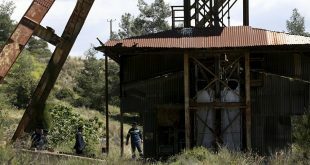 “We are looking for those behind the arsonists,” Toskas told REAL FM and pointed out that “there are interests, for land-based reasons. Some want to see hotels where the forests are? Possible. 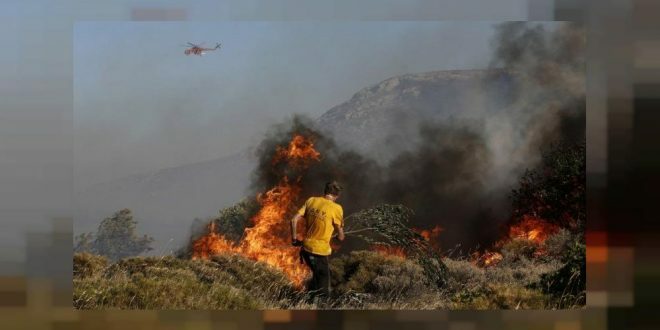 We are not naive, we know it and we’re not going to let them get away with it, no matter how much time passes by.” He also said that the fires in Kalamos, Saronida and Veikou park were caused by arson.